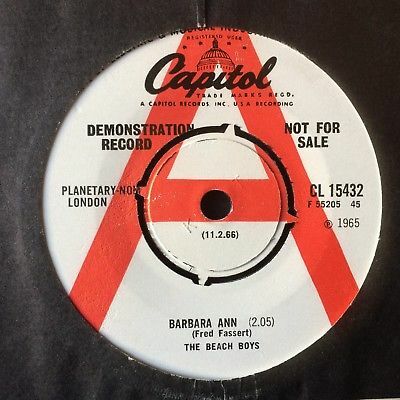 Issued during 1965, here's a nice copy (small surface scratch on B side) of a rare UK original Demo copy of this classic tune from THE BEACH BOYS with "BARBARA ANN" on the UK Capitol imprint # CL 15432 and backed with "GIRL DON'T TELL ME". This copy plays superbly throughout on the 'A' side with top audible quality and remains in mint minus condition with just the finest of light surface sleeve rubs and minimum of crackle on the run-in and run-out groove. However, the 'B' side has a small surface scratch that causes a light rotational click during the last 20 seconds and through the run-out groove but otherwise, plays great so is only graded excellent. It has the 4-prong centre intact and the labels are very clean on both sides without any written annotations and with light spindle wear. Paired with an original company sleeve and still a very decent copy for the collector (see picture scans). As this record will likely achieve a sale price in excess of standard Royal Mail compensation levels, it will be shipped in a stiffened card outer by Royal Mail Special Delvery "B4-1" service only at a cost of £7.99 in the UK or, overseas by "Signed For" service at the costs indicated. This provides protection for both parties in the unlikely event of loss.